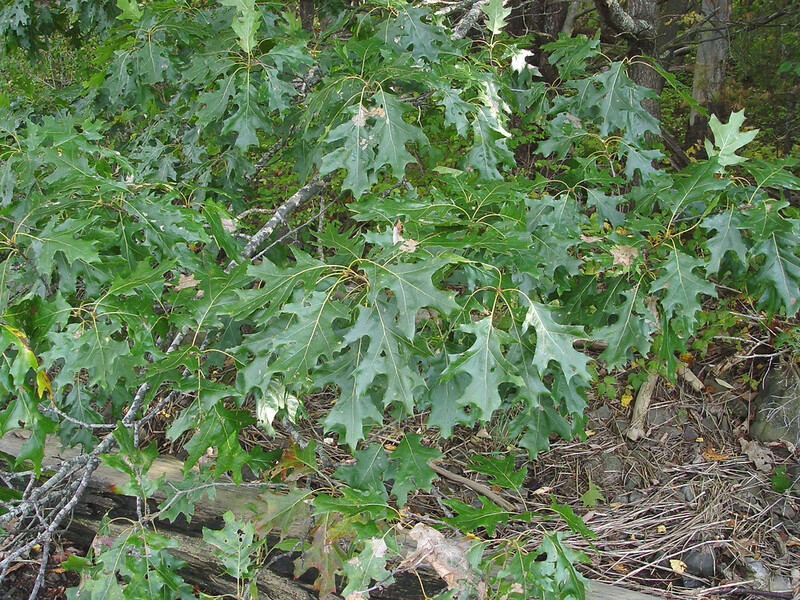 Quercus velutina. By Donald Cameron. Copyright © 2015 Donald Cameron.New England Wildflower Society.gobotany.newenglandwild.org (Accessed 1/2015). Quercus velutina is a tree to about 20 m tall; 70cm dbh; lives 150 years; red oak group (subgenus Erythrobalanus); bark blackish, rough, fissures making squarish, chunky pattern, twigs usually thinly hairy, winter buds 4-angled, densely finely hairy, 0.7-1 cm long; roots associated with ectomycorrhizal fungi (Decker and Boerner 1997). Leaves alternate, with 7-11 shallow, bristle-tipped lobes, lobes usually with several coarse, irregular, bristle-tipped teeth, generally larger, thicker than red oak leaves, glossy above, hairy in vein axils below, often widest above middle. Flowers monoecious, green, male catkins, female flowers 1-few, April-May, wind pollinated, hybridizes with Q. rubra and other red oak group species. 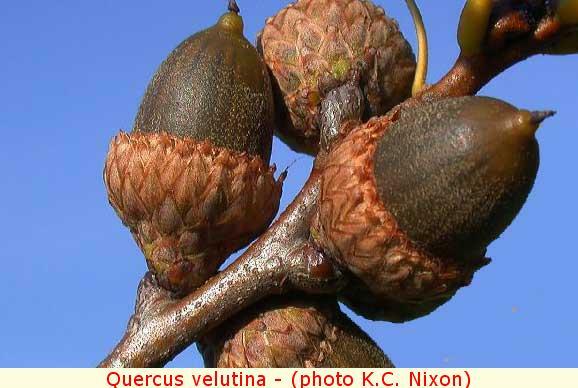 Quercus velutina.K. C. Nixon.http-::jeanlouis.helardot.free.fr.page_chenes.Quervelutina.pinterest.com (Accessed 6/2015). Fruit acorns 1.5-2 cm, cap bowl-shaped, covering half of nut, scales fringed around edge, much smaller than red oak, bitter and astringent from high tannin content, matures 18 months, Sept.-Nov., acorns “mast” every few years, producing very large crops, timing depends on both weather and years since last masting (Sork et al. 1993). Cap covers 1/2 nut, scales large, edge fringed, Sept.-Oct.; Seeds dispersed by squirrels, blue jays (Darley-Hill and Johnson 1981) and other animals that bury acorns and fail to retrieve them. Seeds germinate spring following dispersal. Acorns eaten by many birds and mammals that do not bury nuts (raccoons, foxes), (Martin et al 1951). Seedling drought tolerant (similar to white oak). Quercus velutina. Arthur Haines. Copyright © 2015. 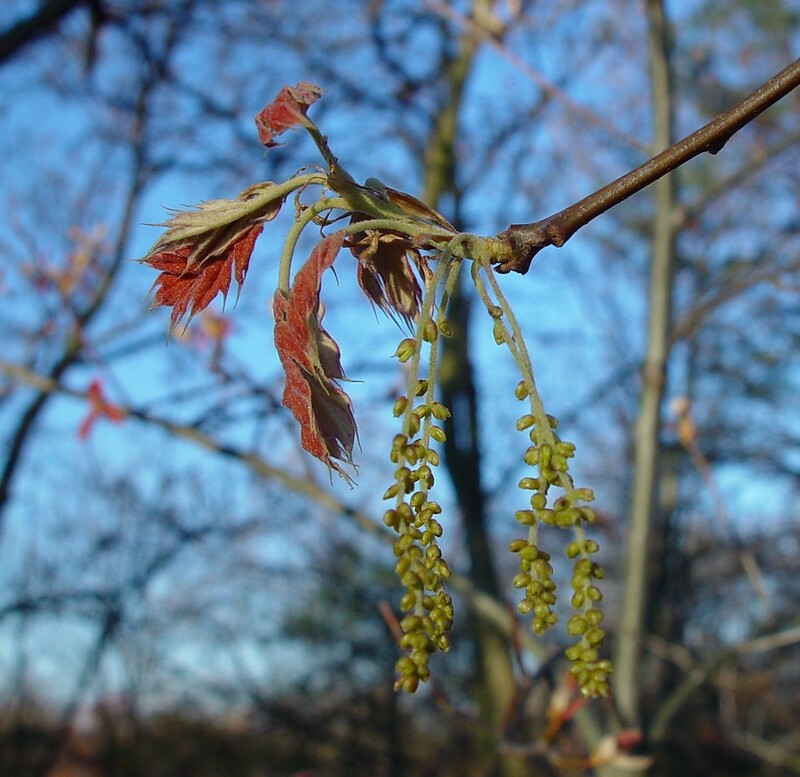 New England Wild Flower society.gobotany.newenglandwild.org (Accessed 1/2015). Habitat: Older forests. Moist to dry native soils, pH 4.5-6.5, upland areas in mixed oak forests. Found in soil pH 5.0 (Gargiullo unpublished data). Moderately ozone tolerant. Tolerant of drought, salt. Moderately tolerant of shade, index 6-8 (similar to Q. rubra). Intolerant of soil compaction and flooding. Quercus sp. in the red oak group are generally less drought tolerant than those in the white oak group (LeBlanc 1998). 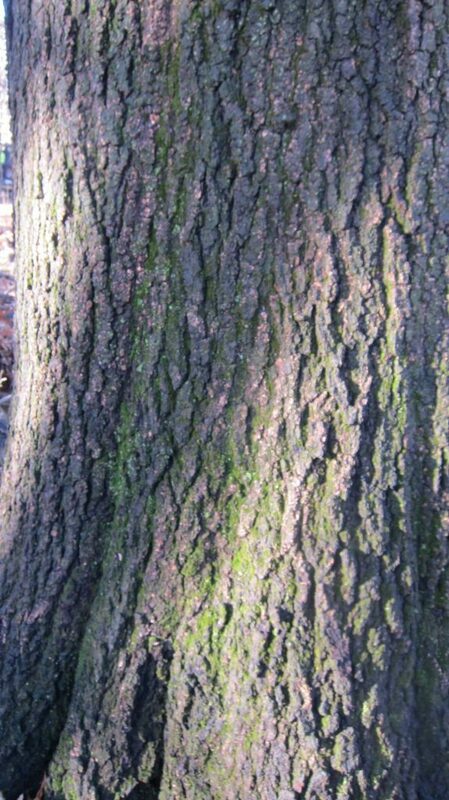 Quercus velutina bark.David Burg.Spuyten Duyvil, NYC. close-up.3/2017 (Accessed 3/2017). Notes: Root sprouts if damaged. Able to persist in open understory. Deer and rabbits eat twigs, other animals eat buds. Foliage eaten by Gypsy moth larvae and other insects. Susceptible to fire damage which allows infection by fungi. Oak bark beetles (Pseudopityophthorus spp.) and sap feeding beetles (Nitidulidae) spread potentially fatal oak wilt (Ceratocystis fagacearum). This fungus may also spread through root grafts. Damaged trees may be killed by shoestring root rot (Armillaria mellea). A favorite host of gypsy moth larvae (Lymantria dispar) which may kill trees by repeated defoliations. Acorns killed by nut weevils (Curculio spp.) and gall forming Cynipid wasps (Callirhytis spp.) among others. Gray squirrels reported to open oak galls to eat insect larvae within (Dersal 1940). (See Q. alba for other insect predators).